Anyone who knows me personally will know I've not been up for doing much blogging recently, but I had seen this coat online and thought I would treat myself, and get back into the swing of things - doing what I love! 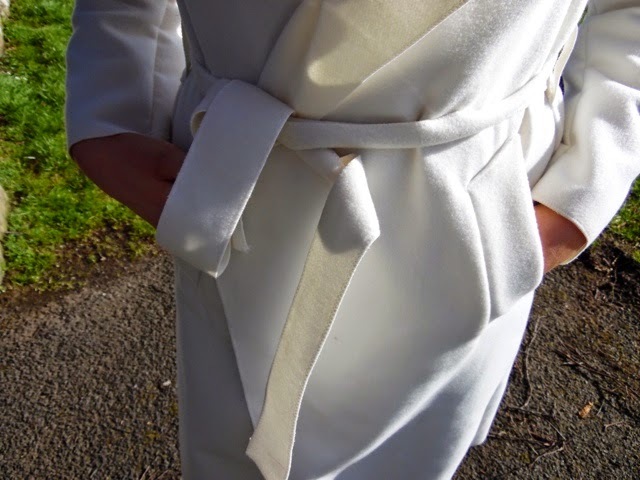 White is such a difficult colour to maintain, especially when wearing fake tan and makeup, but I thought this one was just too beautiful and at such a fantastic price, I couldn't pass it; it's perfect for this time of the year as well, as its a very light material, perfect for the changing weather. The waterfall effect at the front of the coat adds so much dimension to it, makes it look and feel like you've a lot more layers on you than you actually do (yet the light material ensures it doesn't drown you)- and the tie around the waist is so flattering. I wore this out for dinner, just over a plain top, with skinnies and heels, but it's so lovely and elegant over a dress if you're going to a more formal occasion such as a wedding or, like I did, at the weekend - just add another pair of jeans, a scarf and boots for shopping! White is one of my favourite colours at this time of year, it brightens up my wardrobe and the dark winter colours it contained, so this will definitely be making a few appearances.